On Monday night (June 27), a semi-circle of ten musicians in the NAC Studio performed the Ottawa debut of a recreated symphony by a Polish composer. SORROW by Colin Stetson is summed up in its subtitle: "A Reimagining of Górecki's 3rd Symphony." Composed in 1976, Henryk Górecki did not immediately know that he had penned the most successful piece of contemporary classical music. Inspired by the etchings on the wall of a Gestapo cell, the Symphony far outsold all classical recordings of the 20th century when it was recorded in 1992 as Symphony of Sorrowful Songs. The first movement began with Stetson's growl on a contrabass clarinet that slowly woke up all the players, one by one. Shahzad Ismaily on a moog synth and Justin Walker playing a rare brass-style Steiner MIDI EVI came in slowly, adding to a foreboding atmosphere. 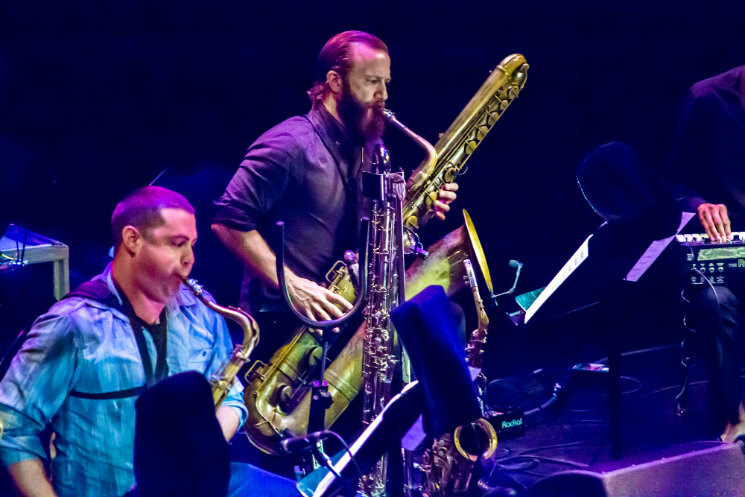 This was accentuated by duo Matt Bauder and Dan Bennett, clarinettists and sax players whose playing allowed for Stetson to swap his silver clarinet for a tarnished bass sax. Profoundly influenced by Górecki's composition, Stetson didn't so much remix on record as he did elaborate. Live, he added a black metal affectation, with electric guitars played by Ryan Ferreira and Grey MacMurray, and electronic wind instruments and synth. The interpretation was organic, even as drummer Greg Fox (Liturgy, Guardian Alien) left his seat with each crashing blow to the cymbals. Stetson made eye contact with the string section, either with his life partner Sarah Neufeld on violin or one of the guitarists, and silently conducted with a cross-like motion of his right hand when he wasn't playing. Neufeld and cellist Rebecca Foon (Esmerine) created a weeping din that sounded like far more than just two instruments. The first movement contained no release — it just grew for 28 minutes until, at the last moment, it sighed to a close. The 11th member of the small orchestra was Megan Stetson, the saxophonist's sister, who took the three-movement dirge across varying degrees of agony and depressed resolve. By the end of the third movement, "Cantabile-Semplice," the mezzo-soprano was crying as she smiled and sang the final lines of a Polish folk song in which a mother is looking for her dead son. From start to finish, not a single English word was spoken. The 40-year-old symphony, at once a voice for the incarcerated and the lost of the Second World War, spoke for itself.